We’d love your help. 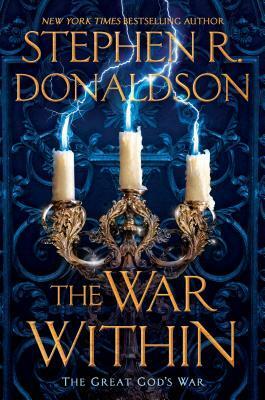 Let us know what’s wrong with this preview of The War Within by Stephen R. Donaldson. It has been twenty years since Prince Bifalt of Belleger discovered the Last Repository and the sorcerous knowledge hidden there. At the behest of the repository's magisters, and in return for the restoration of sorcery to both kingdoms, the realms of Belleger and Amika ceased generations of war. Their alliance was sealed with the marriage of Bifalt to Estie, the crown princess of Amika. But the peace--and their marriage--has been uneasy. To ask other readers questions about The War Within, please sign up. This second book in the series has a much broader base as well as being longer than the first book. Whereas the first book had a central character, here the story is told from a number of viewpoints with no clear central character. As such, there is not a linear timeline and there are some historical descriptions. The writing is in the third person, which provides some objectivity to the writing. The characters are richly described both physically as well as in terms of attitude. As with other t This second book in the series has a much broader base as well as being longer than the first book. Whereas the first book had a central character, here the story is told from a number of viewpoints with no clear central character. As such, there is not a linear timeline and there are some historical descriptions. The writing is in the third person, which provides some objectivity to the writing. The characters are richly described both physically as well as in terms of attitude. As with other tales by this author, the central character from the first book is a damaged individual driven by circumstances. He is frustrating and not particularly likable. Other characters are also purposeful; all of the fleshed-out characters are complex in their own ways. The world building is expansive and vividly described. Conversely, the magic system is kept largely at a distance except in critical points in the plot. Magic is hoarded or vilified. In a similar way religion, whose presence is newly imposed, is either seen as harmless or a profound risk. Tension and danger come from a variety of sources and there is no one single bad guy. The focus changes from character to character as well as point in the story. This is first and foremost a story about the resolution of hidden dangers. Characters and locations carry the tale forward to its conclusion. The pace is not hurried but has sufficient tension to lead the reader to the next scene. It is an interesting read and the richness of the writing is served by the steady pace. Threads of the plot are developed through the central characters. The number and nature of these characters become clearer as the story progresses and by the end of the book, there are distinct and well-developed plotlines that will be carried forward to the next book. I'm alway a bit at loss for words when I have to review a book by a giant of fantasy. It's been a long time since I read The Chronicles of Thomas Covenant and I was happy to read another book by mr Donaldson. This book is not an easy read as it's full of characters, different point of views, a complex plot, and a pace that sometimes it's very slow. Even if there are some issues it's a fascinating read and once you're hooked you cannot put the book down. It took me sometimes to get involved but I lov I'm alway a bit at loss for words when I have to review a book by a giant of fantasy. It took me sometimes to get involved but I loved what I read and I can surely say this is the work of great fantasy writer. The world building is amazing, rich of details and it makes you crave for more details and more adventures. I look forward to reading the next installment. This is an excellent read! Powerful, well-written fantasy that plays to the author's strengths. In particular, it has a psychological depth that is rare, and comparable to that in the author's early work. The first book introduced us to Prince Bifalt - who could be a stubborn and single-minded character. And he only gradually learned about the larger world in which the plot takes place. That made the first book a frustrating read at times, but the second book shows what we were heading for, and i This is an excellent read! Powerful, well-written fantasy that plays to the author's strengths. In particular, it has a psychological depth that is rare, and comparable to that in the author's early work. The first book introduced us to Prince Bifalt - who could be a stubborn and single-minded character. And he only gradually learned about the larger world in which the plot takes place. That made the first book a frustrating read at times, but the second book shows what we were heading for, and it was worth it. There are now multiple points of view, and those give an important contrast to Bifalt - he's still stubborn, but we see other aspects to him. We also see that he's just one part of the bigger picture, which is an interesting high-stakes battle between forces as powerful as gods (or that actually are gods). At the same time, we see how this struggle affects various interesting characters, big and small. The overall impression is a world rich with detail, and the conflict draws us in and makes us care about the outcome. And the new points of view are quite enjoyable - again, a big contrast to Bifalt. In particular, Estie and Elgart. Several of the minor characters are a lot of fun as well. Various odd or unclear aspects of the plot in the first book are explained - those weren't dangling threads. Sometimes a second book is tempted to rush forward, but Donaldson handles the consequences of the first book's events in a realistic way, with nothing important left out, while still heading forwards. More than once I found myself impressed by how all the pieces fit together well.